It is often a fine line between some war films and some spy films, but generally the nature of the mission helps to separate the films into their correct categories. There is no mistaking that Saving Private Ryan is a war film. Whereas Where Eagles Dare, I believe is a spy film. At no time are the characters referred to as ‘soldiers’ – they are always referred to as ‘agents’. Also they are dressed in enemy uniform which makes them spies. So Where Eagles Dare is one of the great spy films. It is also one of the great ‘Boys Own Adventures’. Sure, if you analyse the story carefully, you’ll realise that it is biggest load of nonsense ever contrived. But it was never meant to be art. It was meant to provide thrill-a-minute action, and a plot full of twists and turns. And on that level, Where Eagles Dare succeeds admirably. The film opens with a German warplane flying over the Austrian Alps. Although it looks German, it is English and it is transporting seven men on a dangerous mission. As the plane moves towards it’s destination, the film flashes back to the mission briefing. They are told that an American General, Carnaby (Robert Beatty), who was travelling by plane to meet his opposite number in Russia, has been shot down. He has been captured and taken to a Nazi fortress called the Schloss Adler in Bavaria. Carnaby holds the key to the Allieds next major offensive and time is of the essence. They must rescue him, before the German’s get any information out of him. The mission is to parachute in, infiltrate the Nazi fortress, rescue the General and get out. Sounds easy, doesn’t it? Some of the men on the mission are Major Smith (Richard Burton). He is the leader of the group. Next on board is Lieutenant Schaffer (Clint Eastwood). Schaffer is a walking arsenal. Then there’s Capt. James Christiansen (Donald Houston), Edward Berkeley (Peter Barkworth), Capt. Philip Thomas (William Squire), Sgt. Harrod (Brook Williams), and Sgt. Jock MacPherson (Neil McCarthy), who are all M.I.5 operatives. After the briefing the film cuts back to the mission at hand, and the men parachute out of the plane and into the snow. There’s no point outlining too much of the plot as it would take as long as Alistair MacLean’s novel, on which the film is based. But there are double crosses, triple crosses, and convoluted twists and turns throughout, that will keep you guessing and on the edge of your seat..
You cannot talk about Where Eagles Dare without mentioning the cable car sequence. Two German spies are trying to make their escape down the mountain in a cable car when Smith attempts to stop them by leaping onto the roof of the car as it starts down. On the roof top, he attempts to plant a bomb, but the two spies inside the car, crawl out the windows and onto the roof. It’s a staggeringly suspenseful and well staged action scene, and one that was almost replicated in the James Bond film Moonraker, made eleven years later. Hardly any of the characters in Where Eagles Dare are who or what they seem and certainly cannot be trusted – with the exception of good old Lt. Schaffer. 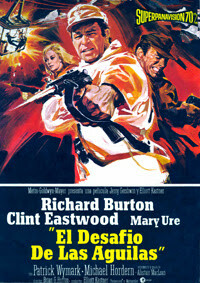 Eastwood as Schaffer is pretty wooden, but it doesn’t really detract from the film. Eastwood’s acting is really limited to blowing things up or shooting people. It doesn’t require much emoting. The real star of the movie is Richard Burton as Major Smith, the mission leader. Smith is the only character who really knows what the hell is going on. Even though it’s an action film, Burton still gives a commanding performance. His voice is so authorative, and in places threatening, it’s easy to believe the contrivances the script forces upon his character. The film also feature’s a couple of beauties. After all this film was made in the sixties, and even a war film still has to adhere to the swinging sixties ethos. Mary Ure stars as Mary Elison, another spy who is working with Smith. And Ingrid Pitt has a small role as the buxom bar wench, Heidi. Also worth mentioning is Derren Nesbitt as Major Von Harpen. He is the Gestapo Officer at Schloss Adler, and although Nesbitt’s role is fairly small, his presence and threatening persona dominate the middle of the film. The music by Ron Goodwin is exceptional. It is deliberately melodramatic, and follows the plot twists well. It also makes great use of staccato – almost machine gun style – military drums. Where Eagles Dare is one of the best films of it’s kind, and despite it’s age, it holds up incredibly well today. Highly recommended.